A handy solution for powering 12V equipment such as car coolers, small to medium sized camping fridges, etc, from a mains AC power source. 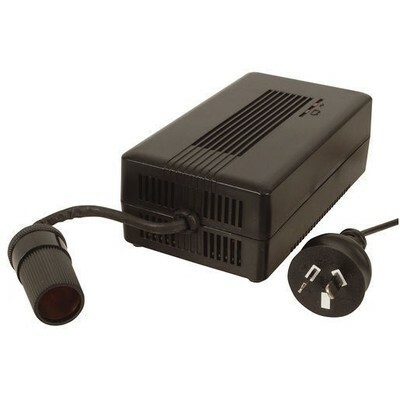 Supplied with a 1.5m output lead with cigarette socket output, making connection simple and easy. Please check the maximum output current needed for your device is less than 7.5A including the start-up power draw (which is more than the average operating draw). If your device requires a higher output this unit is not suitable and warranty will be void. Any damage caused by use of a device which can draw more than 7.5A is at the buyers cost, so please check this first prior to ordering. Not suitable for commercial purposes. For larger and/or more powerful fridges, please see our 12.5A Adapter. Excellent product. Ran my small fridge for 3 days without a hitch. Company service was great. Product arrived quickly even though it was Xmas time. Excellent product. Ran my small fridge for 3 days without a hitch. working well on large portable fridge, prob better that the one that came with fridge that didn't last long! handy to have for other things that might need to run off 240v to 12. would definitely recommend it to anyone. Item works well and is half the price of a Waeco unit.